When you’re in need of an orthodontist in the Greater Toronto Area that’s able to provide quality orthodontic care, we at City Orthodontics are glad to be here for you. We offer a wide variety of efficient orthodontic treatments along with the care needed to guarantee a comfortable and convenient experience for you. One of these treatments that we’re proud to supply in our Toronto office is Invisalign. Invisalign differs from traditional braces because the aligners are removable. However, that doesn’t mean that you don’t have to take care of them as much as you would for braces. 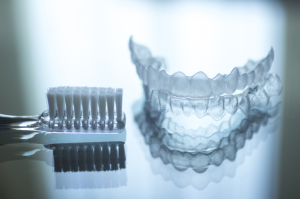 We’d like to take this opportunity to give you a few tips on how to best care for your aligners. Just like how your mouth is always exposed to plaque and bacteria, your aligners are exposed to them as well. This is why it’s important to clean your aligners too. Whenever you go to brush your teeth, you should brush your aligners. We recommend using a soft-bristled toothbrush and toothpaste. Brush them in the same manner as your own teeth and rinse them out thoroughly afterward. Also, make sure the water’s not too hot – which will lead us to our next point. You need to be careful that your aligners aren’t in a position where they can get overheated. Aligners are made of a plastic resin that has the potential to warp if it gets too hot. When this happens, it can cause the aligners to not fit properly. To keep your aligners from being overheated, you should make sure not to rinse them in hot water or drink anything that’s hot while your aligners are in. There are a number of instances where you’ll be taking out your aligners. For example, you’ll take them out when you’re eating, cleaning your teeth, drinking something hot, and so on. In these circumstances, it’s important to keep your aligners in a safe location. This is why we provide you with cases for your aligners. By keeping your aligners in the case, you’ll be much less likely to lose the aligners. Also, they won’t get dirty by being left out in the open and you won’t accidentally mishandle or damage them. If you have any further questions about caring for your aligners or the treatment process in general, please don’t hesitate to contact us. We at City Orthodontics are glad to help you in whatever way we can. If you happen to be interested in Invisalign or any of our other orthodontic treatments, we encourage you to give us a call at (416) 222-3223. We can’t wait to hear from you! At City Orthodontics, we aim to give each and every patient in and around Toronto the opportunity of achieving the beautiful smile that they deserve. We aim to accomplish this through our high-quality orthodontic treatments, including many types of braces. However, attaining a great smile requires more than just orthodontic treatment – it requires a constant commitment to oral hygiene. If you happen to be wearing braces, here are some proper oral hygiene tips we suggest to keep your mouth as healthy as it can be. If you’re interested in scheduling an appointment with us, feel free to give us a call at (416) 222-3223. If you have any questions or concerns, please don’t hesitate to contact us. We can’t wait to see you and help you achieve the beautiful smile that you deserve!